For me, understanding this chapter centres on grasping verse 13 "for it is God who works in you to will and to act according to his good purpose." Do you see that little bold word? That little 'in' word is loaded with meaning. I don't know about you, but I sometimes forget that I'm not working for God and he's not working for me or with me. God is working in me. 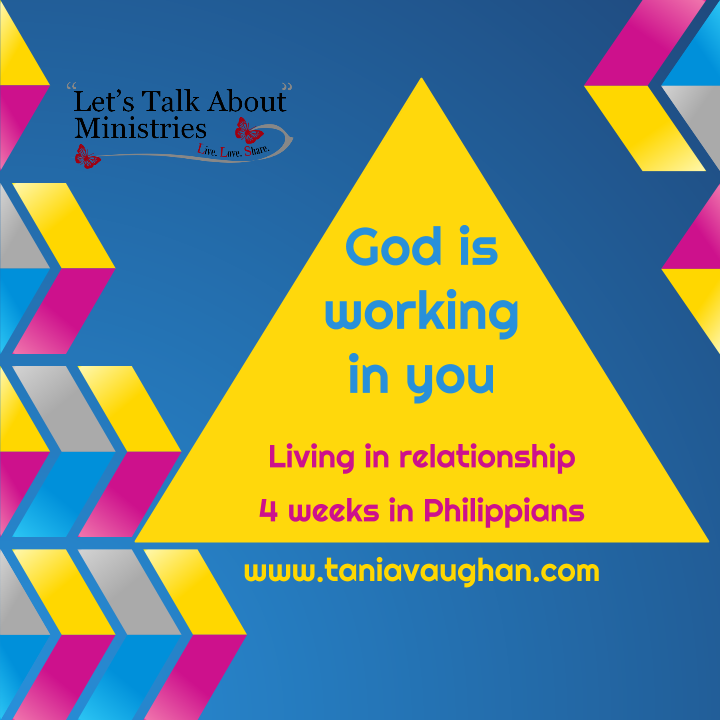 God is working in you. Why is that little word so important? Without it the rest of the chapter is just too hard, it is too against everything in my nature and it is certainly against the way the world around me looks. It starts in verse 3 and goes on to verse 18; all these ways of living that I cannot do, without God in me. Don't be selfish, ambitious, vain or conceited (verse 3). We live in a me first, all about me world. Look after number one, do anything to succeed, you deserve it all, go out and get it. Try and go against that tide in your own strength and you will drown, but you have God working in you. Consider the interests of others, more than that, consider others better than yourself (verses 3-4). What? Even people with a low opinion of themselves can look at others and think "Well, at least I'm not as bad as that!" I say I am that bad and I'm worse, every person is better than me. That's almost impossible to process, but you have God working in you. Don't complain or argue ever, over anything! Not dirty dishes or slow drivers, not standing in line or people chatting in the supermarket, not when you're point is valid or when you know you're right. Don't argue, don't complain, really, not even once a day? You can do it, you have God working in you. We live in a crooked and depraved generation (verse 15) and we are living to be different, to stand out, to be noticed - not so that people notice you but so they notice Christ. Go right back to verses 1-2, why are you doing all this? You are united with Christ, being like-minded and imitating him. We all fall short and that's okay because, "God works in you to will and to act according to his good purpose." When I became a Christian my folks were understanding but didn't see why I'd made that choice. My dad once said "There are more good people outside of church than in it". His sentiment was spot on - there are lots of good people outside the church, but its the motivation that is different. When we come into relationship with Jesus we strive to follow his witness and do things sacrificially; ie without personal benefit or praise and that's hard. Society teaches us to ask "what's in it for me?" Well the answer is simple, God's love. Ever seen a film called 'Pay it forward'? In it we see how a child, completing a social studies assignment, performs a selfless act for 3 people with the idea being that; a) they each do the same for someone else and b) the giver expects nothing in return. Is it me or does this sound familiar? When we start to reflect the witness of Christ in our own witness then we will really see verse 13 come about and see God at work in us.